UPS My Choice membership options help me keep track of my shipping, and that’s important to me. As a blogger, I have various packages coming to my home on a regular basis, and it can be difficult to keep up with all of it. It’s especially important when I’m on a deadline, so it pays to be able to see the progress of all of my packages. Post contains affiliate links, all opinions are my own. I’m a UPS My Choice member, and I love it. With all the packages that come to my home, I need an easy way to keep track of them all, and being a UPS My Choice member helps with that. It’s easy to sign up, easy to use, and it’s FREE. Bonus! Keeping track of packages is great for business, sure. It’s also great for personal use, as well. 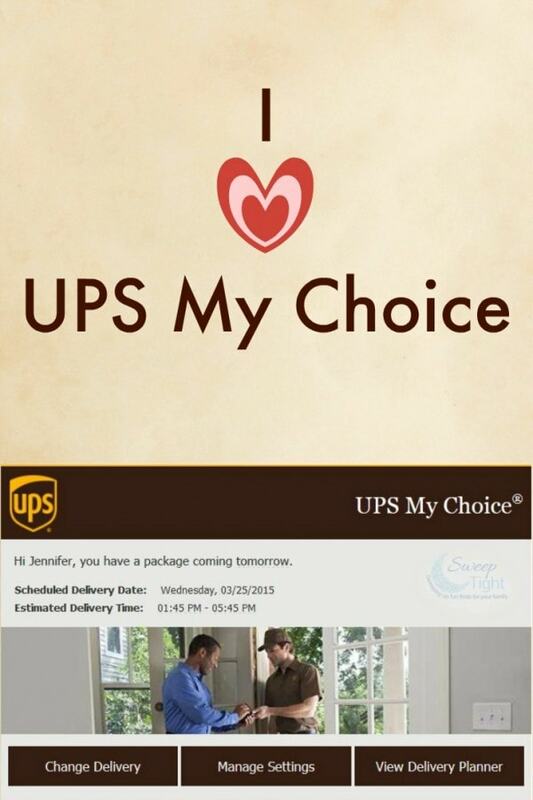 UPS My Choice membership allows you to track any package being delivered to you by UPS. This offers another layer of protection and peace of mind when you shop online, especially at online auction sites. It’s so easy for someone to sell something they don’t have and then claim it was lost in the mail. For those of you that enter sweepstakes, you might not even know if a package is coming your way. Not all sweepstakes notify their winners. Sometimes a box just arrives with no warning. UPS My Choice will send you an email if a package is being delivered to you via UPS. I have had many “surprise” emails like this, and it’s a great heads up to know a box is on its way. UPS My Choice membership also offers peace of mind because you no longer have to be stuck in the limbo of wondering when a package will come or if you’ll be there. No more being chained to the house or wondering if you did, in fact, hear a knock on the door. Now you control all of that. And it’s pretty cool. As you can see, most UPS My Choice membership perks are absolutely free, and the paid options can sometimes be well worth it. It worked so well for me, I upgraded my UPS My Choice membership to a premium package. At $40.00 a year, it was well worth it for me, and it might be for you as well. Give UPS My Choice membership a try. The basic version is free, so you really can’t go wrong! I get a lot of delveriyes as I do get out much.Ups has been consitance. I love UPS My Choice too! I’ve been using this for a couple of years. Very handy. I am a member of the UPS My choice and have been for quite some time, I love it! I use this service and like it because it really helps me keep track of my packages when they are coming and I love it because it is free!! II have not enrolled in UPS My Choice yet. At first I thought I don’t get enough packages for it to be worthwhile. But the program is free, and when I do have packages (c0ming an going) it would be nice to have the service. Thanks for the heads up.